1. What is Relational Interviewing? 2. Building Working Relationships. 3. Selecting, Finding, and Approaching Interviewees. 4. Strategies for Conducting Interviews. 5. I Have My Data—Now What? 6. The Ethos of Relational Interviewing. Appendix Interview Excerpts. Lee Ann Fujii is Associate Professor of Political Science at the University of Toronto, Canada. This is a little gem of a book about the process of interviewing. Lee Ann Fujii skillfully weaves together a critically reflexive relational philosophy with helpful examples and good practical advice. In this important text, Lee Ann Fujii shows how qualitative researchers gather high-quality data through field research. In this inherently social and relational process, she shows how the researcher and subject together produce narratives and other kinds of data, and argues for why analysis should focus on the data’s underlying logic rather than merely the reconstruction of facts. These themes are rarely given such clarity and emphasis – Fujii’s is a very wise text. 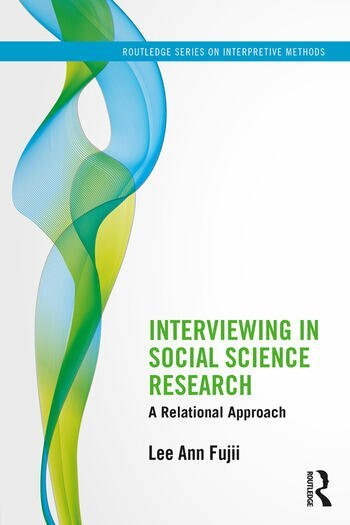 In Interviewing in Social Science Research, Lee Ann Fujii promotes a logic and rationale for relational interviewing, explicitly accounting for the duality in power dynamics and discourse between interviewer and subject. In the course of an interview, each party continuously attempts to make sense of the other and to feel secure in their midst. Consequently, Fujii argues that an interviewer’s ability to properly analyze the "data" rests in their reflections on the mutual agentic acts unfolding during the conversation: moments of silence, reverse questioning, abrupt refusals to talk about issues that are then talked about, and other such behaviors. This important book gets to the heart of the messiness and the revelation of the research-interviewing endeavor, to uncover how people make meaning in the social world. A fascinating and thought-provoking read, Lee Ann Fujii's new book has particular value in making reflexive ethics integral to the relational approach. Fujii offers a practical guide to interviewing, combining accounts of real-life (but rarely shared) challenges from a range of studies from across the world, with advice about how to manage complex issues, including selecting participants and addressing positionality. A great resource for students and more experienced researchers.